BEST-MK 1122 is a one-component, solvent-free, low strength and low viscous anaerobically curing adhesive based on di-methacrylate-ester. BEST-MK 1122 is the standard product for securing of threads. It is also recommended for sealing of thread connections. In applications on fine threads and grub screws its low strength allows loosening the connected parts without any damaging. 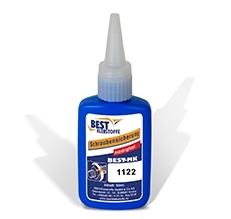 BEST-MK 1122 is of low viscosity and automatically spreads in the thread. Disassembly is possible with standard tools without causing damage to the thread.